The Somerset Evolution off-road pop-up campers are available in several different models, and were built to withstand the hardest terrain with a 6-inch heavy-duty tubular steel main frame, 15" off-road tires, and alloy rims, the Evolution series can go just about anywhere your vehicle can tow it! 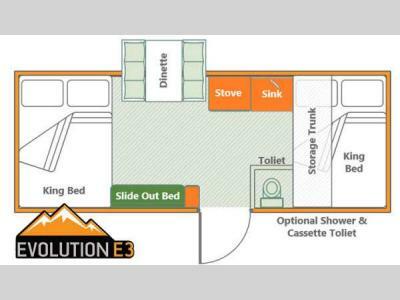 Inside each camper you will find conveniences that you are sure to love from the refrigerator, stove, shower, flushable toilet, and many more. Each camper features a Power Roof System that is the smoothest, quietest, and most reliable in the industry today. The beds are designed to slide out easier, and with the supports built in, you don't have to worry about loose poles or lost parts! So, for a quality built camper, come get your Somerset Evolution and let your off-road experience start today!